The political cartoonist discusses his first book from OR Books. 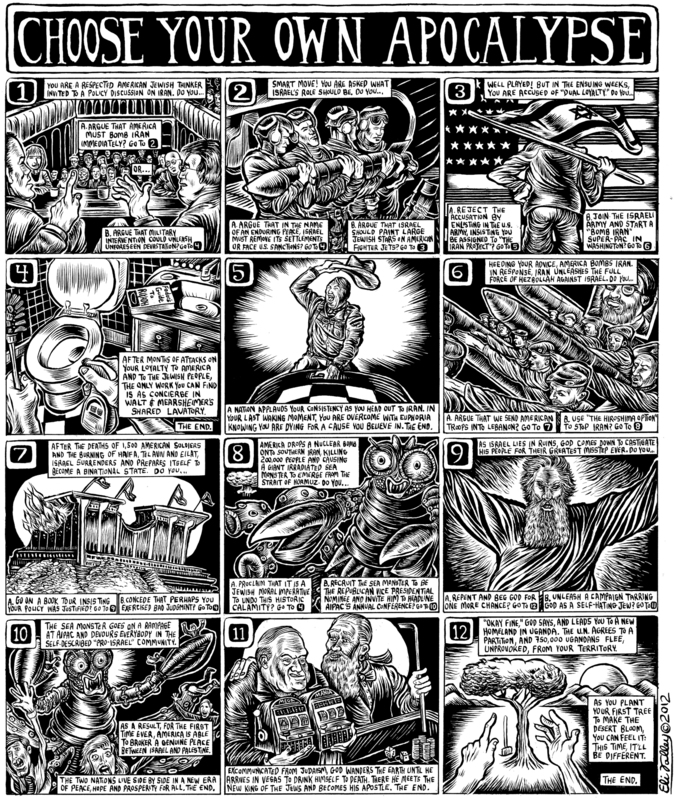 Eli Valley has been making comics for just over a decade. 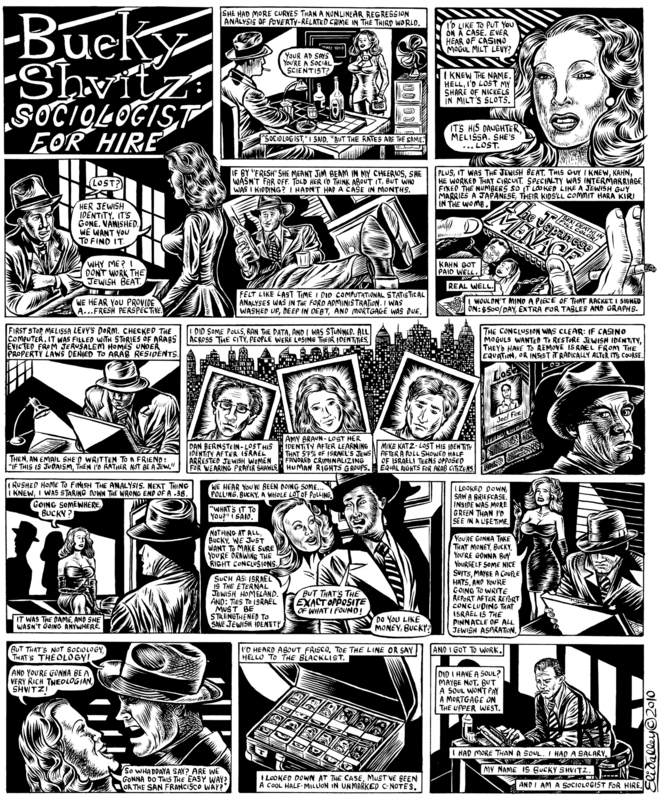 Unlike most political cartoonists, though, most of his work aren’t single panel comics, but rather long page-size comics intended for a broadsheet publication. In The Forward, +972 Magazine, The Nib and other publications, Valley has been skewering politics and individuals in hilarious, grotesque and inventive ways. 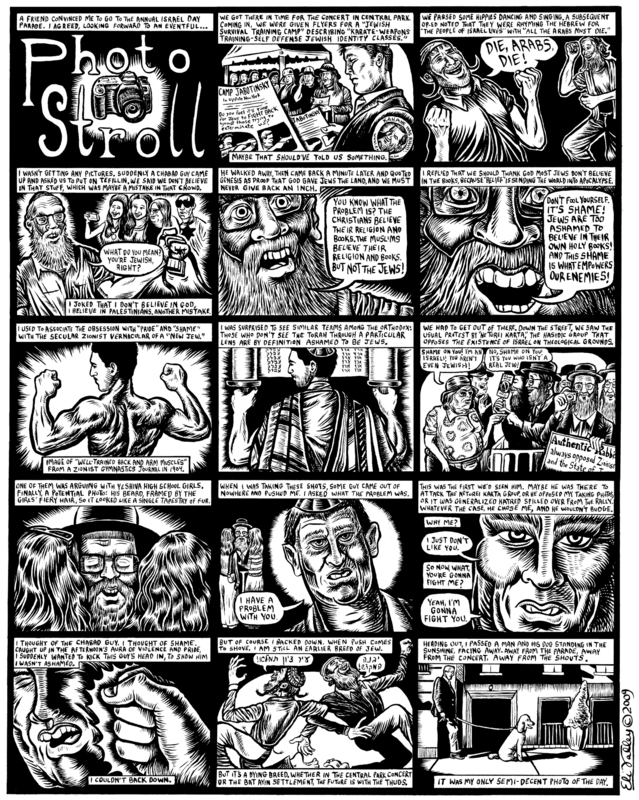 In these longer comics, which show the influence of EC Comics and other horror artists, Valley shows himself a gifted artist, though sometimes his own exaggerations aren’t nearly as grotesque as the actual words spoken by actual people that he’s skewering. Some of his comics have their own shock and awe, as Valley is not afraid to offend people or worry about people’s sensibilities. This has led to problems with some editors, he’s been denounced by individuals, but he refuses to shy away from controversy. 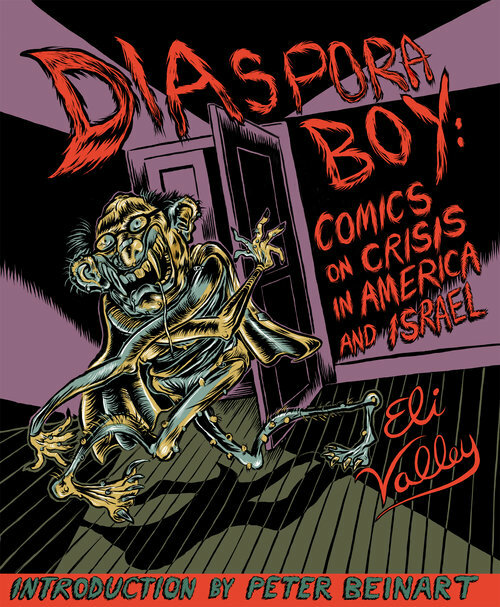 His first book Diaspora Boy has just been released by OR Books with an introduction by Peter Beinart. He took time out to talk about the book and how his work has changed in the past year. Were you always drawing comics? I was throughout my childhood and adolescence. I was doing it for as long as I can remember. I stopped for a number of years after college for a number of reasons, one of which was it’s hard to make a living doing it. Also I was living in Prague and there were lots of other things happening. I took it up again with the earliest comics in this book. What kinds of comics did you like when you were young? Because reading your work, I see a very big EC Comics and Mad magazine influence. When I was little I was into DC Comics, I have to say. Also, Archie, which I probably got as hand me downs from my sister. I wasn’t really into horror titles until adulthood partly because the ones that were available when I was young were comics code approved horror titles and they were just horrible. I shouldn’t say that because some of them are actually great in retrospect, but in general they were horrible. As a kid I loved reading the Mad Super Specials where they would include an example from the fifties. I didn’t understand the pop cultural references – they were talking about stuff like Howdy Doody or either comics from the time or television shows that weren’t well known among kids – but the style, the crazy frenetic and kinetic style, just blew my mind. 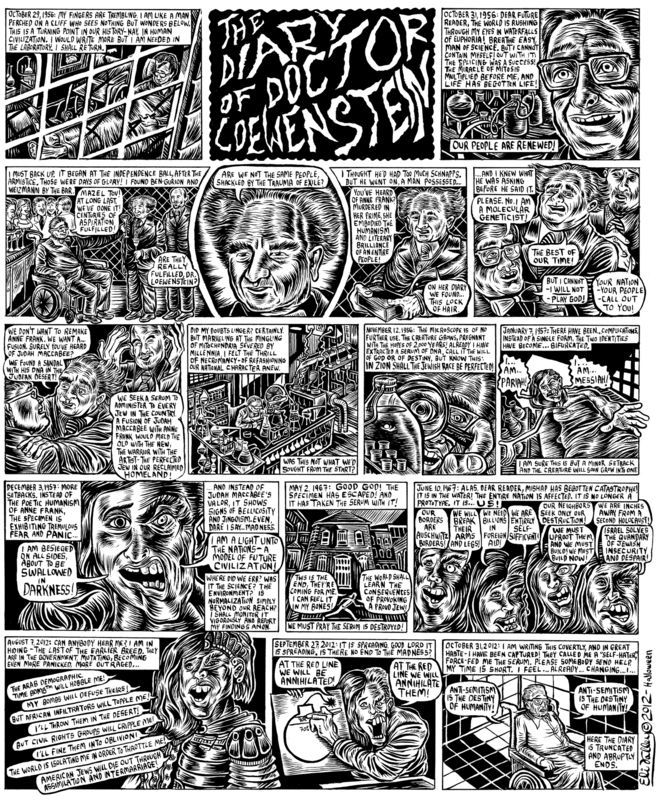 It was interesting that the same people who were drawing the Mad comics were also drawing the EC horror titles and weird crime titles and it’s interesting that they could do both reverence and then irreverence, and serious and studious and then also working without any kind of rules, which is what Mad felt like. When did you start making these longer cartoons? It was in 2004. I was writing some op-eds and I enjoyed it but I realized that drawing is not a skill that everyone has. I assumed that everyone is able to write if they’re intelligent – which is not true, I realized. But at the time I thought, everyone can write but not everyone can draw. I can use that to make my POV be not lost in this clutter of op-eds. That was one of the original reasons. There was this Iranian Holocaust cartoon contest competition in 2006 or 2007 and so a cartoonist in Israel decided to create a competing competition, tongue in cheek, saying that Jews can do anti-semitism better than anybody else. I don’t remember if it was Holocaust cartoons or Anti-Semitic cartoons, but it was all tongue in cheek. I didn’t win of course but I got to know the guy and that was my re-entry into drawing. It made me want to do it more. I need to emphasize that that was not typical for my work. That was for an Israeli contest that was tongue in cheek about Anti-Semitism. It was making fun of Anti-Semitic stereotypes. I get this criticism of being Anti-Semitic by Jews who equate all criticism of Israel with Anti-Semitism and I strongly and emphatically fight against that. I just want to make that distinction. That is a very good point and it’s one you make in the book as well. You have a lot of notes in the book and it was interesting to read that your editors, especially at The Forward, had you rewrite cartoons, and I don’t say this to excuse anyone’s thinking, but you repeatedly made comics about specific people or groups or events, but what was printed was an attack on a non-specific straw figure. I agree with you completely. I tried to explain that in the notes to “Evangelical Zionist Tours of Israel”, which wasn’t about Jews but the EIC of The Forward had me remove the reference to Christians United for Israel, which is this extremist apocalyptic yearning group. It was literally targeting them. So when I removed that it made it sound like all evangelicals who support Israel are these bloodthirsty monsters. I’m like, no. I’m talking about specifically John Hagee who is the head of this group. When you remove that, it really denudes the satire to a large degree. It was funny in a sense reading these because you have so many cartoons about Benjamin Netanyahu or Abe Foxman, and they’re still around and often saying the same things. I think they’re even more relevant today given the silence, in some cases – complicity in other cases – with this Trump regime. Netanyahu’s behavior, even post-Charlottesville, has been unconscionable. We should never forget that. I don’t want to say that you’re making these for the Jewish community, but there is a sense of you’re a part of this community and making them first and foremost for the community. I can’t deny that there is an element of internal discourse and debate. On an individual basis, without the notes and without the background, the comics might be somewhat confusing for the outside reader. But with the notes in the book and taken as a whole hopefully they’ll be much more accessible to people who are not in the Jewish bubble. You assume a lot of knowledge and awareness of your readers. Yes. That’s why in the book the annotations are helpful. I don’t talk down to the reader. I’m using specific words that a lot of contemptible leaders have used. They have denigrated the majority of American Jews and I’m throwing it back in their faces. If you don’t follow these things, if you don’t read what Abe Foxman has uttered about American Jews or what Netanyahu has uttered about the majority of the world’s Jews, it might be confusing. So yeah, I’m assuming a certain degree of current events literacy and communal dialogue literacy of my readership. How do the Stuart the Turtle comics go over. I remember the Bernie Sanders one from last year and this idea of Sanders’ Jewish roots and thinking got a lot of play. I actually gave a whole presentation about that Stuart comic last year. The way that Jewish writers were talking about Bernie Sanders was just so offensive and so dismissive, largely based, as I say in the notes, on either his criticisms of Israel or his not defining himself in exclusively Jewish terms. The figure who was often used as contrast was Joseph Lieberman. I share very little in common with Joe Lieberman and he’s not a model for most American Jews, but because he wears a yarmulke and openly talks about his Jewish faith it’s assumed that he is the authentic Jew and Bernie Sanders is some kind of artificial Jew. He was getting that from a lot of people. Even mainstream news articles. That infuriated me so I made the comic. Stuart in general is a great vehicle for lampooning the absurd blinders and cloistered mentality of those on the Jewish right. That’s emblematic of so many of your comics. American Jews overwhelmingly supported Barack Obama and Hillary Clinton, for example, but many of the leading figures in the Jewish community don’t represent that point of view. They’re the un-elected leadership of the American Jewish community and they have very little in common with most American Jews. It’s an outrage that they are allowed to speak on behalf of us. As you point out, far right Orthodox Jews have more in common with far right Evangelical Christians, who most American Christians don’t agree with on most things. It’s interesting in terms of polling. There’s a Pew poll in the past year or two in which it reveals on various matters Orthodox Jews and Evangelical Christians are on one side and everyone else is on the other. Zionist and Orthodox viewpoints are passively accepted as representative of diaspora Jews, when we’re mostly secular and we don’t see Israel as the core of our identity. This is your first book. Had you been trying to assemble a book for a while? Because my comics take so long to draw I never really knew if I had enough material for a book. When I was talking to OR Books I realized I had enough. If it was done in a broadsheet format like this one is where the comics can breathe and you can read the small print, I do have enough. Not only do I have enough, but this is ten years of work. They chronicle this period of increasing division between American Jews and Israel, and American Jews and their putative leaders – at a time when both America and Israel have been heading either towards or off a cliff. A forerunner to the Trump era. You’ll definitely have another decade of material. [laughs] Yes. Netanyahu is like Israel’s Trump and we’ve experienced that for the past ten years or so. The way that people usually reacted to Netanyahu is a harbinger of how we react to Trump. Almost all Jewish leaders failed that test. He’s a demagogue and he’s a bigot. That was recorded repeatedly. There’s one comic in the book on page 131 from after the elections in Israel and it catalogues American Jewish reaction not to Netanyahu but to Obama for his criticism of Netanyahu’s bigoted last minute election ploy of saying, the Arabs were coming. I think that is a really good predictor to how they’ll act under Trump. Also that attitude, that kind of normalization of demagoguery, is one of the seeds that’s been implanted over the past decade that allowed Trump to rise. I keep talking to political cartoonists this year and we keep talking about what’s changed since January. To what degree has covering Trump required a new or different approach for you? We made a huge quantum leap with Trump. You can see the seeds prior, but it was a huge lurch with him. It’s hard for me to do the multi-panel broadsheet comics under Trump because the news keeps lurching. One week we were terrified of a nuclear confrontation with North Korea and then Charlottesville and then his response to Charlottesville. This is on a week by week basis. We forget Stephen Miller’s comments about the Statue of Liberty. It makes it hard, especially if you draw multi-panel comics slowly like I do. I have one that I started and I’ve just never finished it. It’s just nine panels and these comics take a long time and you’re racing against the clock. We’re under so much stress; we’re really in this fight or flight mechanism as a country right now. That’s one of the reasons I’ve been doing more single panel or four panel comics, because they can be done more quickly, but also they react to a more precise event. Also I’m sure other people have told you this, but hyperbole is difficult under Trump. He is a walking hyperbole and whenever you think that you’re satirizing him, he will go further. It’s difficult to satirize that. I think grotesquery is well suited to it, but you can also see comics artists using other methods that are pretty appropriate. You have recent cartoons like Stephen Miller going back in time to kick his ancestors out of America because they couldn’t speak English when they arrived. You’re not really exaggerating what he said. True. People were pointing out that his great-grandparents couldn’t speak English so when [Miller] said, if you can’t speak English, you can’t come here, he was literally referring to his great-grandparents. It’s not much of a stretch. Plus his condescending comments towards Jim Acosta at that press event. And calling [Acosta] “cosmopolitan” which is a code word for Jew, historically. Then he was revising the interpretation of Emma Lazarus’ poem. That’s a common neo-nazi interpretation. He was channeling white nationalists saying that liberty is a beacon to the world not a beacon for the world. Diaspora Boy is a physically large book and I wondered how big do you work? 14” x 17”, but for the past three years or so I’ve been using a wacom to draw so I’ve been doing it digitally. It’s hard to say size on the computer, but when I was drawing them on pages, the broadsheets were 14 x 17. You mentioned that you’re a slow artist, does the tablet help you work faster?